Beveridge & Diamond welcomes Meghan Morgan to our Boston office as an Associate. Meghan’s practice focuses on environmental and toxic tort litigation and counseling clients on environmental regulatory issues, including product regulatory compliance under the Consumer Product Safety Commission and California’s Proposition 65. She also has experience advising clients on federal environmental and occupational health and safety standards. “Meghan brings additional capacity and skills to our new location in Boston. Clients will benefit from her experience with the Attorney General’s office as they interact with government lawyers and regulators in the Commonwealth and beyond,” stated Boston Managing Principal Marc Goldstein. Meghan previously served as a Special Assistant Attorney General in the Massachusetts Attorney General’s Office, where she represented state agencies and officials in civil litigation, including defending legal challenges to state regulations and decisions of state administrative agencies. Meghan has prepared and argued cases in front of the Massachusetts Appeals Court and Superior Courts throughout the Commonwealth. 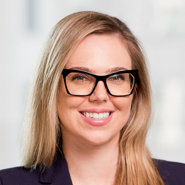 She also has experience managing and litigating large toxic tort cases, which augments the firm’s already strong capabilities in this critical practice area, and will also be supporting our land use litigation and project development practice.